← Earth’s oldest living things! Help! Can you identify this insect? On cottonwood (Populus deltoides) | Beaver Dunes State Park, Oklahoma. This entry was posted in [No taxon] and tagged ID challenge, nature, Oklahoma, quiz, science. Bookmark the permalink. 12 Responses to Help! Can you identify this insect? 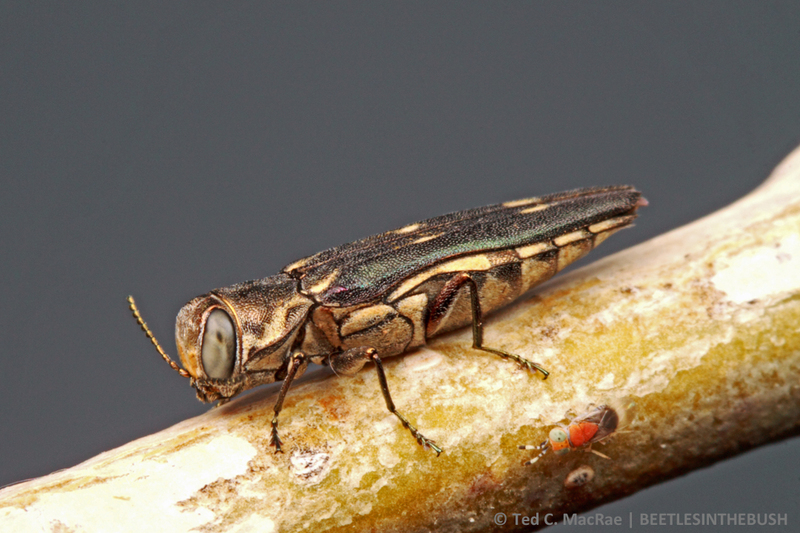 It’s a buprestid. Probably in the genus Agrilus, because It looks a lot like an emerald ash borer except for the colour. I assumed you knew what the beetle was and were asking about the wasp. Encyrtidae? Looks a lot like this one. The Agrilus looks very close to Agrilus (Uragrilus) ater in Europe. The colour differ, but the white pattern is almost similar. Agrilus ater also lives in Populus and Salix. The non-Buprestid appears to be an Encyrtid wasp. This looks like one of the wasps that parasitize the eggs of certain stink bugs. Is that a coniopterygid larva? Or is that actually part of the branch? Probably way off, but the buprestid does seem to superficially resemble the sole specimen of Agrilus impexus on BugGuide. Subsequent research revealed that the BugGuide specimen is mislabeled. True Agrilus impexus is found in the Great Plains, while the southwest material was redescribed recently as A. paraimpexus Hespenheide. I presume the two are similar in appearance, so I’m gonna stick with my guess of Agrilus impexus. For some reason I’m thinking more in the genus of Acmaeodera? I’m wondering how many species keep the same dots pattern. I suspect a complete longitudinal stripe first evolved in several lineages and then subsequently underwent reduction in many of the species to form the familiar 6-spotted pattern.